What are cloud condensation nuclei? Cloud condensation nuclei (CCN) are aerosols that act as the initial sites for condensation of water vapor into cloud droplets or cloud ice particles. Virtually all cloud droplets or ice particles originate around some sort condensation nuclei which tend to "attract" water. The above satellite image clearly demonstrates the effect of cloud condensation nuclei on cloud formation. 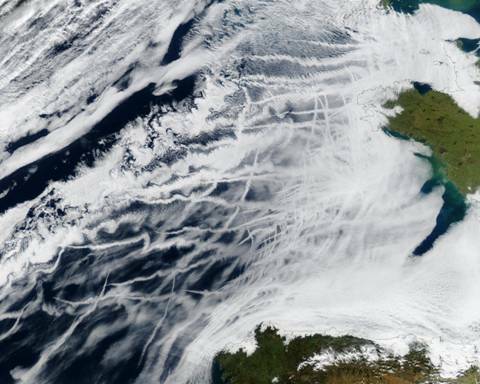 Ships travelling the ocean off of Europe produce aerosols as they burn fuel, and those aerosols help to form low clouds in the shallow, cool, and moist layer of marine air that exists there. The nuclei that help to form cloud clouds are extremely small, 0.0002 to 0.006 millimeters (0.000008 to 0.0002 inches) in diameter. Most condensation nuclei come from the soil, the ocean (sea salt), and the burning of vegetation and fossil fuels. These aerosols then eventually get washed out by precipitation, which cleanses the air of them. SUNSPOTS AND CLIMATEThere is a controversial theory, advanced by Henrik Svensmark, that changes in solar activity affect cloud formation on the Earth. Since clouds act as a natural sunshade, more or less cloud cover can cause global cooling or global warming. The mechanism Svensmark describes involves how much solar activity changes the amount of cosmic rays entering the atmosphere, which have been demonstrated in the laboratory to be able to form cloud condensation nuclei.